Itarsi is a city in Madhya Pradesh in central India. 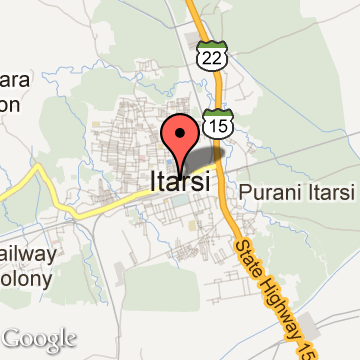 Itarsi is in Hoshangabad District, south of the city of Hoshangabad. It is a commercial hub for agricultural goods and is famous for its railway junction. It has Ordnance Factory Itarsi of the Ordnance Factories Board which maufactures products for the Indian Armed Forces. The Bori Wildlife Sanctuary and Tawa Dam are nearby. The small town of Itarsi is located in the central region of India in Hoshangabad district of Madhya Pradesh. The area of Itarsi is popular for its rich handcrafted handloom clothing and ancient art crafts. The town of Itarsi is a combination of both agriculture and industrialisation that resulted in a range of economical activities and development of the town. The presence of several Ordnance factories and soya oil mills here helps in the economic growth of the town. There are several places of religious importance in different parts of the town like Evangelican Lutheran Church, Hanuman Dham, Tilak Sendoor, Roman Catholic Church and Pentacostal Church of God. The Hindu temples here include the Boodi Mata Mandir, which is visited by large number of tourists every year. Itarsi also has shopping streets with small shops that sell handmade handicrafts and clothing. Itarsi Tourism - Get all information on Itarsi tourist places and sightseeing tours. Our website helps you plan your next tour and gives you great ideas on what to do, where to eat, where to stay and when to go there. We give the best information from the web to give you precise, meaningful and useful travel guide for leading places to visit in India and from across the world. Our travel information on ITARSI tourist places, tourist attractions, major sightseeing, the best time to visit, the top places to visit in Itarsi, the must-see things to see and do, maps, restaurants, hotels, nearby tourist destinations, local public information and more. To start with check out information on how to reach Itarsi.